It's summer time. It's hot. And what's the thing you crave most when it's hot? Well, duh. Ice cream! Or if you're me, sorbet. Yummy, fruity, light sorbet. Only sorbet hasn't always been the easiest thing to serve up to a crowd, to kids, or even on the go. Jolly Llama made my summer when they contacted me and asked me if I wanted to test their brand new sorbets. In instantly said "Yes, please!" and sent them my address. Little did I know they were going to send the package right away and that I was going to get a frantic call from M while I was in Chicago. "There's a big box here and it's marked perishable. Should I open it?" He opened it and found lots of sorbet. I instructed that he was to find a way, any way, to fit each and every ounce of it in our freezer. He did. I don't want to know what had to be sacrificed. It doesn't matter, it was all worth it. I tore into my first Jolly Llama sorbet when I got home and I was delighted to discover that they more than lived up to my expectations. Tasty, healthy, fun to eat, and best of all, utterly practical. The four flavors (Strawberry, blueberry, acai berry, and mango) are all-natural, made without corn syrup, no juices or concentrates, and as a bonus happen to be a good source of fiber! Even better, the girls, my delightfully picky eaters, love them! As for me, I keep being torn between wanting to hand them out to each and every one of my friends so they can taste the goodness for themselves and wanting to hoard my stash for myself. - Each sorbet is a great source of fiber - 10% RDI or better depending on the flavor. - Each sorbet is a fantastic source of Vitamins A&C. 50%! - The blueberry and acai berry are also loaded with antioxidants! - Jolly Llama fruit is allowed to ripen on the vine and is pureed and frozen immediately. No fruit cooking here and you can really taste the difference! - The tubes are easy to handle, even for little 2 year old hands. I can hand her one and send her outside and she doesn't need me to help her with her treat. - There's only one con, and you're going to be sad to hear it. 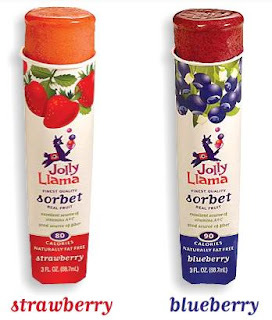 Since Jolly Llama sorbets are brand new they're only available in select stores... on the West Coast. OK. In Northern California. I'm sorry. You'll just have to come visit me and I'll share mine with you. If you're nice. East Coast expansion is planned and coming soon. In conclusion, run, don't walk to your local store and grab a Jolly Llama sorbet or ten. You'll be glad for the new healthy treat or desert option! Disclaimer: I received a few boxes of Jolly Llama sorbets for review, but I was in other no way compensated for this giveaway. All opinions included in this post are mine and mine alone. So this is about a week delayed, but only because I've had my face deep inside a tissue box since I got off the plane and also I haven't so much unpacked as left my suitcase sitting in the middle of the floor in our room. Which I'm sure my husband totally loves. The Top Ten Things I Brought Back from BlogHer. 10. Two bottles of Sobe Life Water. Yes two. Which I stashed in my backpack and had to guzzle as I walked up to the x-ray machine at the airport. Because there was no way no how I was giving them up to security. Three minutes later I had to make an urgent dash to the ladies room. Friends might have laughed at me. Mmm. SoBe. 9. The new Bounce Dryer Bar which makes me happy every time I open my dryer and smell my clean laundry. Nothing like the scent of Bounce to take me to my happy place. 8. A Spiderman book for our LeapFrog Tag System. My 4yo might have preferred a more princessy or pink book, but I love my super heroes and I'm not ashamed to admit it. Plus after months of intense use we're still huge fans of the Tag System and we're delighted to have a new book to explore. 7. A tube of Suave Sleek Anti-Frizz Cream. I have no idea how I have ever lived without this product in the past. Mid-afternoon frizz attack? One dolop and my hair looks better than it did in the morning. Might have to buy a case of it. 6. Diana Orgain's new book Bundle of Trouble. Totally fun mommy mystery. Great fun read. I love discovering new authors. Especially ones that I apparently met. 5. A Pearl of Wisdom brooch from the Pearl of Wisdom campaign to prevent cervical cancer. It's pretty, it's classy, and even better it's raising awareness for a disease no one should succumb to. Pretty good combo. 4. Three treasures from Playskool: A bee, a butterfly, and an old family favorite, Mr. Potato Head. The spud went to join his already extensive family in the girls' room. He was welcomed with open arms by all. The bugs have also been shown lots of love since they were first introduced to the children. I love Playskool. No, let me rephrase that. I pink puffy heart Playskool. They make great toys that really stand up both to the test of time and little kids. 3. A cuddly fuzzy sweet Build A Bear teddy who the girls have declared is mommy's teddy. When I was recovering from BlogHer last week I kept waking up to find him tucked into my arms. He was quite snuggly. I didn't mind in the least. Plus his t-shirt reads "Bloggers are Bearrific!" What's not to love about a bear with such great taste? 2. A couple All detergent chocolate lollipops and some All detergent samples. I haven't tried the detergent yet, but the girls inhaled the chocolate leaving me all of three seconds to tell my long-suffering husband some juicy details about the weekend. Sadly I had to leave the All Laundry Fairy behind though. 1. An awesome Lands End Backpack. It's light and compact. It has pockets for everything. It has a laptop compartment. 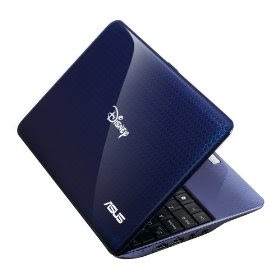 It comes in a ton of colors and looks rugged but sleek. I'm not going back to school any time soon, but you can bet you'll see this baby on my shoulders at Starbucks soon. 1. A cold. A nasty, ugly, icky cold that has kept me down for at least a week now and is morphing into a nasty, ugly, icky sinus infection. If you see the person that was handing these out don't thank her for me. 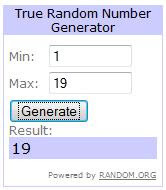 I'm sorry for the long delay on selecting a winner for the Nectar Essences giveaway. Reentry was a bit rough after BlogHer. Ellie from The Art of Losing Myself! Yay! Her set of Nectar Essences sprays will be on their way soon. You can get your own right here.